A few weeks ago, I spoke in New York City at the Progressive Educator Network’s national conference. There I joined a wonderful panel that highlighted resistance to standardized testing. After the panel I got off of the stage and an educator approached me and introduced himself as Caselli Jordan, a kindergarten teacher and musician from Philadelphia. When I saw the look of excitement in his eyes I knew the middle seat, red-eye flight, from Seattle to New York City was worth the trip. Caselli told me that immediately after my presentation, a song jumped into his head and he had to run out to the hallway to write it down. He hummed a little of the hook and I smiled. I was hyped to hear my words had helped inspire a song. He said he was going to work on it more. I told him I would love to hear it. Then other educators and parents came around to further discuss building the authentic assessment movement and our conversation was cut short. I wanted to get in touch with you because in the weeks after the PEN conference in Brooklyn my bandmate Sterling Duns and I came up with a song about standardized testing. I actually started hearing the chorus while you were speaking in the panel and had to get up to leave and go record it 🙂 And after I told Sterling your powerful hypothermia analogy, he put that in his verse. Thanks for all the inspiration and we hope the song can be useful to you. Share this opt out movement anthem far and wide. Let’s bring down the testocracy with a chart topping song that helps people raise their voices to bring back art class and cancel the tests! This is a song inspired by, and in solidarity with the opt out movements throughout the country. 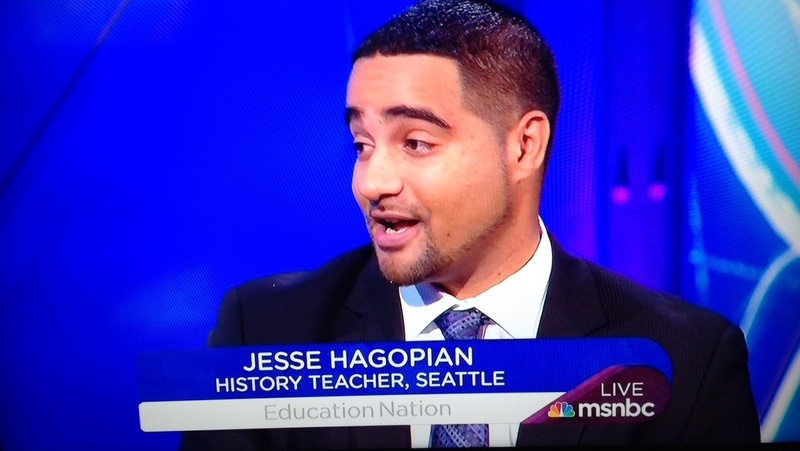 It is inspired by the words of Seattle Map testing boycott organizer Jesse Hagopian at the Progressive Education Network Conference in October of 2015. Politicians, corporations, Gates foundation love that testing. But they don’t want us passing. But they won’t send their kids there. They went to private school! Why you think that is?! Closin schools but building prisons payin guards instead of teachers. now how they gonna reach us? prison guards instead of teachers. build a school to prison pipeline. What you think of that? $33,000 yearly for a single inmate. That’s a private school tuition. But students don’t get half that. What we gonna do? Now tell me is that cool? Spendin 1.7 Billion dollars yearly on the testing. That’s a whole lotta dough. That’s a whole lotta dough man. Whatcha think of that?!? Teachin to the test and takin tests takes a lotta time man. Time away from learning. What we gonna do? Maybe instead of tests we could have a little recess? Have a little art class? What you think of that?! 1. I am reading the interview with Jia Lee. On p. 109, does she mean ‘consciousness” objectors or ‘conscientious’ objectors? Obviously, the latter is more familiar. But if it’s the former (as it is in my edition), I’d love to hear more about what that means and how that’s different from the latter. 2. As I noted, I’m not finished with the book, but I am feeling the need for a dissenting voice. I mean a voice that argues FOR standardized testing or at least one that presents the tests as necessary evils. Will I find one? If not, would you consider adding something when the book is re-printed? Perhaps there’s a transcript of a roundtable or debate you could include? I know the pro-testers get plenty of publicity, but if I’m going to dive into this effort (and I’m ready to), I need more prep on how to respond to the other side. Wonderful book. Inspiring and necessary. More Than a Score is a collection of essays, poems, speeches, and interviews accounts of personal courage and trenchant insights from frontline fighters who are defying the corporate education reformers, often at great personal and professional risk, and fueling a national movement to reclaim and transform public education.